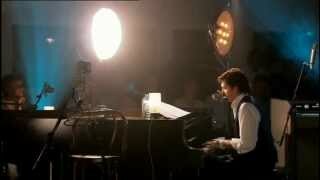 Paul returned to Studio 2 at Abbey Road, the room where all the Beatles records were made, for an intimate journey through his songwriting history, from his very first Beatles song to the work on his new album “Chaos & Creation In The Backyard”. Aided and abetted by producer Nigel Godrich (Radiohead, Travis) & using a selection of vintage instruments from his own collection (including the bass played by Bill Black on Elvis Presley’s orginal recording of Heartbreak Hotel and the Mellotron & mixing desk used by the Beatles) Paul re-visited his back catalogue in new & revealing ways in front of an audience of just 64 people, including wife Heather, Fran Healy from Travis and Guy Chambers among others. He re-interpreted old songs, revealed new ones, played some great cover versions & enlisted the audience’s help in a demonstration of “in the moment” songwriting & arranging. This was the 1st concert played at Abbey Road Studios.